PACE's data will help us better understand how the ocean and atmosphere exchange carbon dioxide. In addition, it will reveal how aerosols might fuel phytoplankton growth in the surface ocean. Novel uses of PACE data will benefit our economy and society. 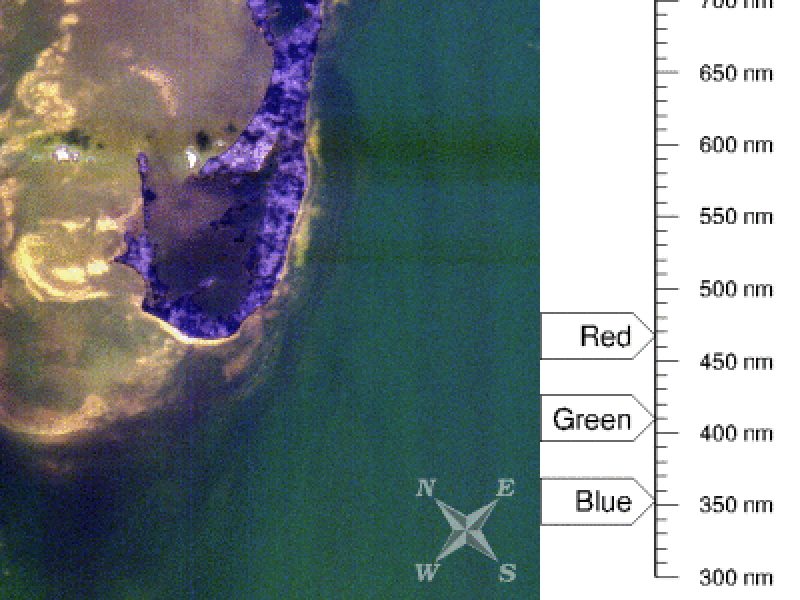 For example, it will help identify the extent and duration of harmful algal blooms. PACE will extend and expand NASA’s long-term observations of our living planet. By doing so, it will take Earth’s pulse in new ways for decades to come. Why Do We Need PACE? Our ocean teems with life and many of its most vital species are invisible to us. Like on land, the ocean has deserts, forests, meadows, and jungles, providing habitats for many forms of life. The types of life in these habitats is determined by microscopic algae that float in our ocean. Known as “phytoplankton,” these tiny organisms come in many different shapes, sizes, and colors. The diversity of phytoplankton types determines the roles they play in ocean habitats. It also determines how well they capture energy from the sun and carbon from the atmosphere. Phytoplankton provide food for small zooplankton, tiny animals that float in our ocean. Like humans, these grazers actively select their food. In the same way, larger zooplankton prey upon smaller zooplankton. Step by step, energy captured from phytoplankton transfers to bigger creatures. As the energy climbs the marine food web, it can ultimately be used by humans. The ocean is a fluid that is constantly in motion. Hosting the largest three-dimensional living space on earth, it supports many habitats. For example, the North Atlantic is home to highly productive "forests" each spring. Its blooms of carbon-rich phytoplankton fuel the fisheries of New England. The crystal-clear waters around Florida host productive coral reefs and fisheries. At times, however, this area is plagued by toxic phytoplankton. 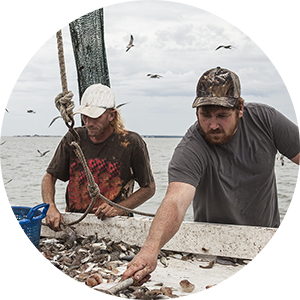 Help us predict the “boom or bust” of fisheries along with marine hazards such as harmful algal blooms. Why do we need PACE? 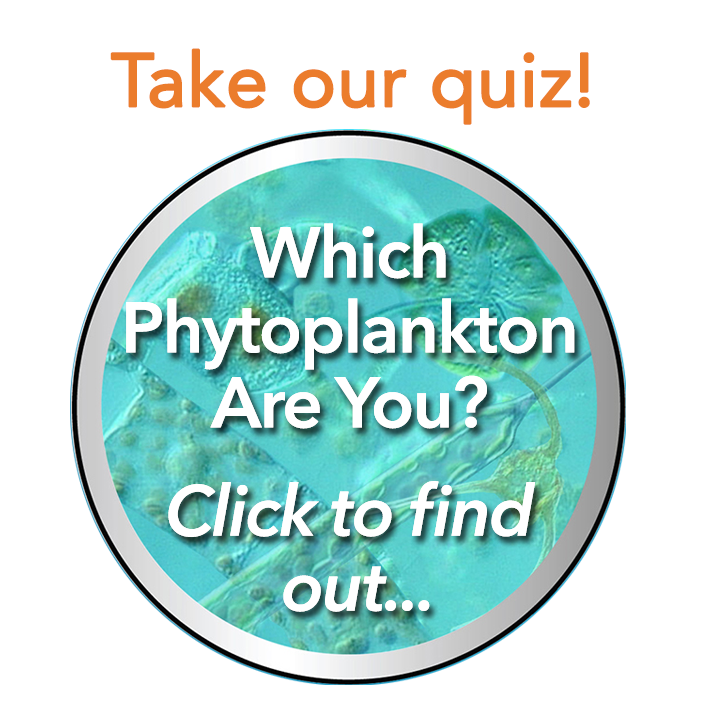 To understand how phytoplankton diversity impacts human life. Small particles suspended in the atmosphere are known as aerosols. Along with clouds, they affect how sunlight is reflected and absorbed by the Earth and its atmosphere. Aerosols and clouds can interact in complex ways, which are not well understood. For example, cloud drops can form on aerosols and aerosols can be washed out of the air by rain. 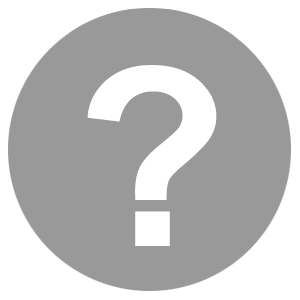 The overall effect of aerosols and clouds on climate is quite uncertain. Aerosols such as smoke, dust, salt and sulfate absorb and reflect different fractions of sunlight. Aerosol types and how they interact with clouds varies a great deal from place to place and over time. Thus, we need satellites to capture a complete and accurate picture of how much energy the Earth is absorbing from the sun. Aerosol data will not only be used to better understand our atmosphere but our ocean, as well. How? Most of the light that is seen by a satellite comes from the atmosphere and its aerosols. Only a small fraction of the light comes from the ocean. PACE will take this into account when deciphering its ocean color data. For PACE to accurately "see" the ocean, we must understand the aerosols present in the atmosphere. Observe fundamental components of our global climate. Carbon exists in forms that range from invisible gases to diamonds. Most life on earth is composed of carbon, as well. In the ocean, a system of physical and biological processes drives the transition between forms of carbon. 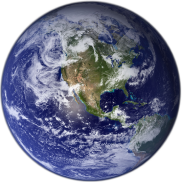 This system supports life and regulates our planet's livable environment. A key process in the carbon system is photosynthesis and its key players are phytoplankton. These tiny plants and algae convert carbon dioxide gas into organic matter. This organic matter, in turn, supplies food and energy to most life forms in the food web. 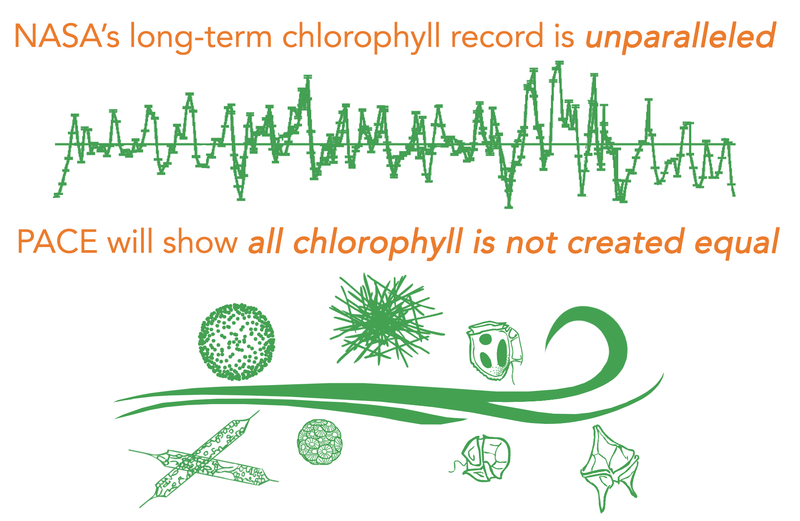 In many ways, the types of phytoplankton in our ocean dictate carbon pathways. Like falling leaves in autumn, larger phytoplankton species can sink from the ocean surface to the sea floor. This process can effectively remove carbon from contact with the atmosphere. Many types of phytoplankton serve as nourishing food sources for zooplankton, tiny animals that float in our ocean. Some of the carbon captured by zooplankton is returned to the atmosphere through respiration. Some carbon is exported to the deeper ocean when zooplankton migrate at night or when they excrete feces. Also, many zooplankton release dissolved carbon in partially eaten food. Marine bacteria, another type of plankton, use this dissolved carbon as an energy source. In doing so, they convert dissolved carbon back into its gaseous form. The examples above show that carbon pathways are many and diverse. Even small changes in the ocean ecosystem can push carbon towards another route. Detecting the diversity of plankton will help us understand how carbon moves between the ocean and atmosphere. Help us predict the routes that carbon will take in today’s ocean and tomorrow's. 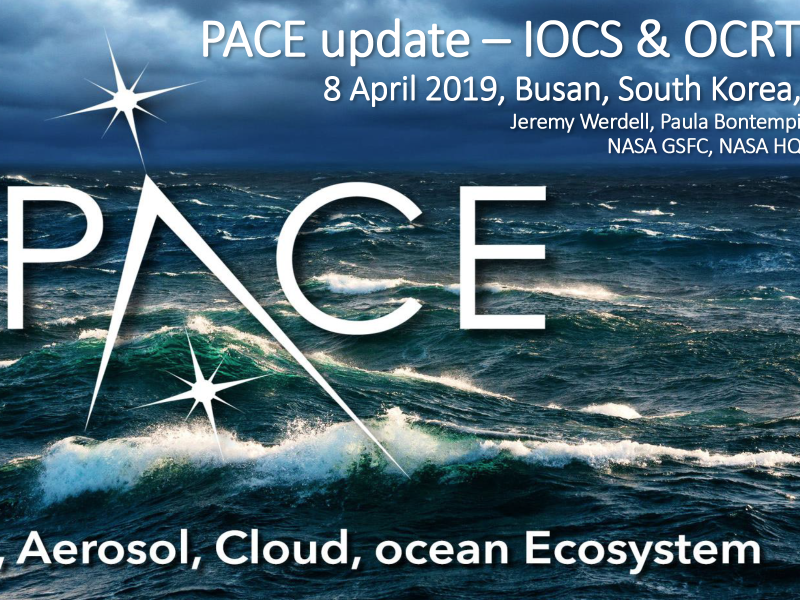 The PACE mission will provide a combination of global atmospheric and oceanic observations to benefit society in the areas of water resources, impact of disasters, ecological forecasting, human health, and air quality. PACE Applications will partner with public and private organizations on ways to apply data from PACE and its scientific findings in their decision-making activities and services, helping to improve the quality of life and strengthen the economy. The U.S. ocean economy contributes over $350B to the GDP (2014) and supports more than 3.1 million jobs (one in 45). Currently, this ocean economy, including the Great Lakes, is growing faster than the total U.S. economy in both contributions to inflation-adjusted GDP (15.6% since 2007 compared to 5.8%) and jobs (8.1% compared to flat). PACE will also observe clouds and microscopic airborne particles known as aerosols that scatter and absorb sunlight. Industry, the Department of Defense, NOAA, policy makers, and scientists all rely on these key data for weather, visibility, and air quality forecasts. Observing the ocean, clouds, and aerosols together will reveal previously unseen interactions, including their exchange of carbon dioxide, how some aerosols can fuel phytoplankton blooms, and how phytoplankton can release particles to the atmosphere that lead to the formation of clouds. These processes affect how much heat is trapped by Earth's atmosphere and are vital to accurately predict weather and climate. What are the long-term changes in aerosol and cloud properties that can be continued to be revealed with PACE? How are these properties correlated with variations in climate? How do tiny airborne particles and liquids – known as "aerosols" – influence ocean ecosystems and cycling of matter in our ocean? Conversely, how do ocean processes affect our atmosphere? How does our ocean's environment – and motion – affect its ecosystems and vice versa? 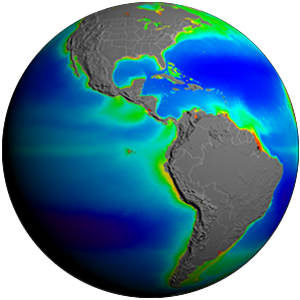 NASA studies the ocean and its role supporting life on Earth, providing ocean color, sea surface temperature and sea surface salinity data and images. Your planet is changing, and we're on it. NASA uses the vantage point of space to increase our understanding of Earth and improve lives.